A 14-year-old girl presented with sudden onset breathlessness associated with swelling over the face, chest and upper limbs. The breathlessness developed after a single bout of cough and progressed within a few minutes. On examination the patient was breathless with a pulse rate of 112 bpm, blood pressure of 106/76 mmHg, respiratory rate of 35 breaths/min and was afebrile. The face, chest and upper limbs were swollen and crepitus was felt on palpation. The trachea was in the midline. Air entry was reduced on the left side and diffuse wheezing was present. An immediate chest roentgenogram was done which revealed subcutaneous emphysema, mediastinal emphysema and a left pneumothorax. A lateral view revealed pneumopericardium (Fig. 1). The patient was managed conservatively with high flow oxygen, antibiotics, bronchodilators and corticosteroids. The patient improved and was discharged a week later. 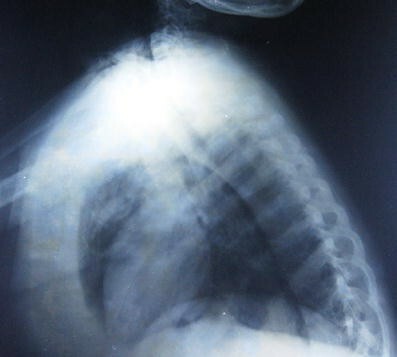 The phenomenon of pneumomediastinum (air in the mediastinum), pneumopericardium (air in the pericardium) and subcutaneous emphysema can result from many intrathoracic causes. The mechanism involves alveolar rupture secondary to raised intrathoracic pressures also called the Macklin effect . Other than acute asthma, pneumopericardium can accompany a number of conditions including mechanical ventilation in neonates, thoracic trauma, following cardiac surgery, fistula formation from oesophageal or gastric ulcers, or even during labour . Although chest radiography helps in the diagnosis of pneumopericardium and pneumomediastinum, computed tomography (CT) helps in confirming the presence of air . Pneumopericardium is usually self-limiting but features of tamponade may necessitate pericardiocentesis. It is important that clinicians are aware of this rare but potentially fatal complication of asthma.